It’s the year 2115, but believe it or not, clickbait is still a thing. In order to arrive at the final destination — a picture of Nadia today as a 154-year-old skeleton — you will have to endure all kinds of tomfoolery. 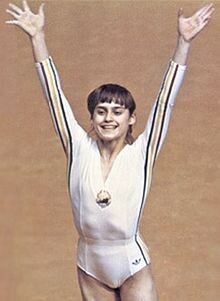 For instance, is that NEXT the button to push to get to the next slide in the Nadia Comaneci story, or will it bring up the ad for the air fryer? And even though it’s the future, it still takes an annoying few seconds for each page to load, as all kinds of data-driven algorithm hucksters snake oil their way onto your computer. And for no reason at all, halfway through you will be subjected to an internet bandwidth test by a sponsor, which will confuse you and perhaps put a virus on your computer. But anyhow, when you get to the end, you’ll see what Nadia looks like today. And it is pretty good. I mean, she was always skinny. But now even more so.